With companies like Profoto and Elinchrom offering an increasingly broad range of self-contained strobes, Broncolor was no doubt feeling left out with its predominantly pack and head oriented lineup. That’s all changing now with the release of the new Siros strobe; a compact, wall powered, feature rich and wallet friendly flash unit. Before we get into the nitty-gritty and start talking about their performance, let’s first clarify what these flash units are. A lot of people seem to think that they are battery powered portable units, however this is not the case. They are AC wall powered, self-contained heads that are more suitable for studio use rather than on-location. Broncolor does, however, provide a power solution via a third party — known as the Leadpower LP-800x — allowing them to be used away from a power supply should you require it. Another misconception that people seem to have is that these units are tiny in size. While I wouldn’t classify them as being bulky, they’re hardly featherweights either. The units are about 12 inches in length and 5 inches in diameter and weigh 7.1 pounds, which puts them at a similar size to a Profoto D1, albeit heavier. While the weight is a bit on the high side, this comes largely as a result of the high-quality materials used throughout the unit which makes it feel as solid as a tank. The Siros comes in a variety of configurations including a 400Ws and 800Ws version, each of which is offered as a basic or "S" version as well as options for Wi-Fi along with built in RFS2.1 or PocketWizard triggering. With this range in offerings, prices run from $999 USD for a basic 400Ws unit to $1,700 USD for the top end 800 S with Wi-Fi and PocketWizard triggering. This puts it right on par with the Profoto D1, albeit at a slightly lower power output, as the D1 comes in 500Ws and 1,000Ws configurations. The Siros is also offered in a variety of 2-light and 3-light kit configurations that includes cases, stands, and modifiers. 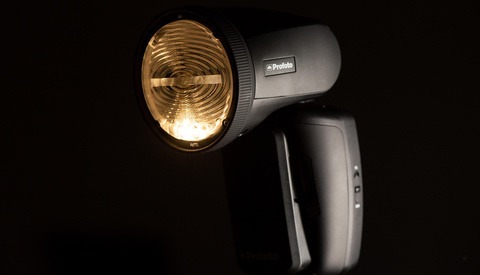 The S version of the strobes differs from the basic model by adding an extra two stops on the low end of the power range, as well as shorter full-power flash durations. Overall, the Siros is intuitive and simple to operate as can be. It forgoes multiple buttons and has only a power switch at the base and a pressable dial and display along the back. For power adjustments you simply turn the dial to go up or down in 1/10 stop increments, or turn it rapidly for full stops. Power can also be adjusted via the built-in RFS or a PocketWizard trigger or the BronControl iPad/iPhone app, depending on the model you’ve purchased. To change other settings, the general flow is as follows: (1) press the dial to toggle the selection mode, (2) turn the dial to select the feature, (3) press again, (4) adjust the feature by turning the dial until the desired value is displayed, and (5) press once more to apply the setting and exit. The majority of these settings can also be set via the BronControl app. One of the cool features included in the Siros is a stroboscopic sequence mode which can fire up to 50 flashes in short succession, the speed of which varies depending on the power level. At minimum power, these 50 flashes are disposed of in around 1 second (see video below). Although one might think of these strobes as the baby of the Broncolor range, their performance is hardly characterized as such. Much like their more expensive packs, the Siros performed flawlessly for the few weeks that I’ve used them. The triggering system never missed a beat, they fired consistently at full power and never showed any issues with overheating, even during long sequences of high-power shots. Both gray card tests and general shooting tests showed excellent color temperature consistency across an extended period of time and heat levels. 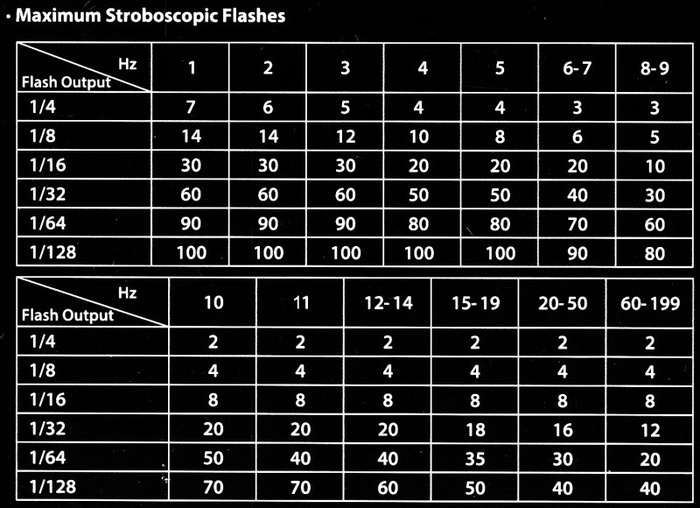 Flash durations on the S model range from 1/8000th to 1/500th - depending on power output - which is similar to the figures of the Elinchrom ELC and Profoto D1. The 9-stop power range of the 800Ws S models that I was using proved to be sufficient for everything I threw at them. At the low end I was able to shoot wide open at f/1.8 without the use of ND filters, and at the top end I was able to close down to f/22 for detailed beauty shots. The 300W halogen modeling light is powerful enough to melt faces at full power and can be set to either full or proportional output. 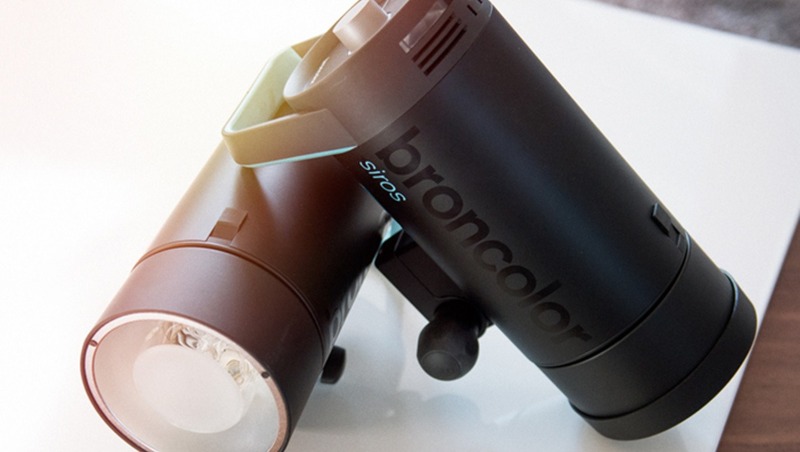 The Siros strobes are the first to integrate with Broncolors new BronControl app which operates over an ad-hoc Wi-Fi connection and is presently offered in iPhone and iPad versions. The overall layout of the app is clear and simple, and establishing a connection with the strobes was quick and painless. To connect to them, you simply need to turn on the Wi-Fi mode on the strobe, find the newly created network on your iPad's network settings, connect to it, launch the app, and select the flash group. 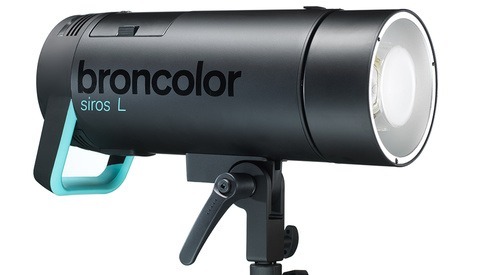 The back of the strobe head also has two colored LED indicators that light up in a unique color, helping you to identify strobes inside BronControl, which is helpful when you have a large number of lights. Although it felt a bit gimmicky to me at first, I quickly grew to like ease the app provided. It was especially helpful in more complex lighting scenarios, allowing me to get to my desired result faster and with less effort. It would be nice if the app offered up some more information along with the controls, such as the flash duration at the chosen power setting, but based on my conversations with people at Broncolor, it looks as though things like this will likely find their way into the app in future versions. The below video will give you an idea as to how the BronControl app works as well as the functionality it has. So what do I think of the Siros strobes overall? Compared to some of their close rivals such as the Profoto D1 or Elinchrom ELC, the Siros seems to have an edge in a few areas. The power range of the S model is better at the low end than the D1 by adding an extra two stops, and also includes some more modern gadgetry like the sequence mode and built-in Wi-Fi control. 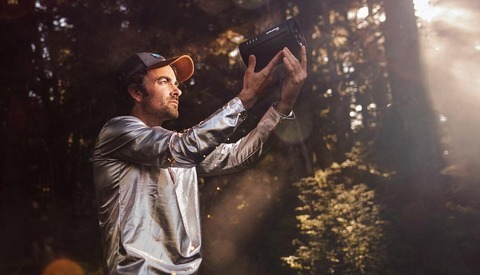 Similarly, it bests the Elinchrom ELC with more sturdy construction, faster sequence rates, and an extra stop in power range, but lags behind in full power recycling times by half a second. Both the ELC and D1 offer 1000Ws of power on their top-end models compared to the Siros’ 800Ws, so you’ll have to determine if that 1/4 stop is important to you or not. In terms of overall performance, the Siros is a real joy to use and delivers the consistent results that I expect from a high-end brand like Broncolor. The video below will give you an idea of the recycle times of the head at various power settings. So are these units absolutely perfect? Well just about, but there were a few minor things that I feel could be improved. The first thing is the pivot adjustment at the mounting point. Although the mount itself is built tough and folds up nicely, the knob requires a good deal of torque to properly lock the pivot into place and leaves little hand clearance when used with a larger modifier (see below). The Wi-Fi connection, although smooth once established, can be problematic if you’re switching various strobes on and off. Often times, turning one of the heads off resulted in a lost connection, thus forcing me to go back into the network settings and restarting the connection process to control the remaining heads. The app, while easy to use also led to a practical issue of iPad/iPhone battery life. Since the iPad pretty much has to be left on the entire time, I ate through my battery in four hours and had to plug it into a charger throughout the remainder of the day. 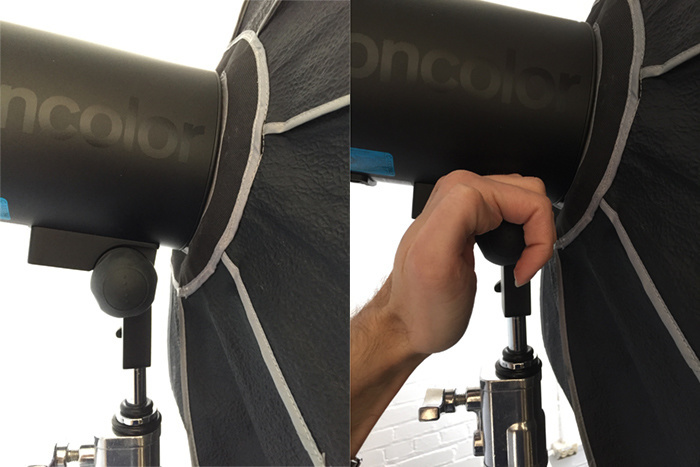 This isn’t necessarily the fault of Broncolor but just something to be aware of. You’ll also want to make sure that you have a dedicated iPad or iPhone for this since you’ll be unable to access the internet on your device once connected to the heads. Whether through the head controls or the BronControl app, it would also be nice to manually control the output of the modeling light rather than being constrained to either full-power or proportional output - a feature that both the D1 and ELC have. Lastly the only other quibble I have is with the weight of the heads. For normal day-to-day operation, the weight and size aren’t too much of an issue, but it does make it nearly impossible to mount them to any of the Broncolor Paras as they become too front heavy and can actually bend the focusing rod. You can mount it on a Para 88 or 133 in either a rear mounted or focused configuration, but it’s still not ideal. All in all, these complaints are minor in the scope of an otherwise excellent product. Whether you’re an existing Broncolor user looking to add more studio lights at a reasonable price, or just looking to get into the Broncolor range without draining your bank account, the Siros a good choice. I personally highly recommend the 800Ws S model as it will give you the features and performance that you’ll need as your skills and business expand. Although the price of the 400Ws base model is tempting, I strongly urge you to spend the extra $600 for the top end version as a long-term investment. Much like the rest of Broncolor's range, they're a well made, high-quality product so expect to be stuck with them for many years to come. A big thanks to B3K Digital for providing me with some additional equipment needed for these lights. Are these IGBT flash units? If not, they're rather pricey. If they're voltage-controlled units, what kind of T1 times do they have? Tungsten modeling lights in an age where LED modeling lights is becoming a standard is rather old school as well, especially for their price. Besides frying your models, 300 watt modeling lights per unit will make a studio, especially a small one, pretty hot in little time. Considering you can get LED replacement for up to 100$ it's no big deal. The should have thought of it though. It makes those flash usable on battery power even with the modeling lights on. They don't use standard lamps in these units, not sure if you can get direct replacement drop-ins for them. The manual seems to state halogen 300W 120V dimmable. Nothing about socket type. I'm sure it's doable but at that price yo are right. they should have done this kind of homework for the potential buyers. When would you use a stroboscopic effect in your work? Sounds more like a feature for commercial sports photographers, unless there are other uses? More and more lighting gear now offers that mode, and I wonder what people use it for? It is an effect you can use for multiple exposures. If you leave the shutter open for 1 second and shoot 50 frames of a moving object you will have 50 different shots of the object as it crosses the frame. I don't know if there is a practical use for it, but it is pretty fun to bounce a ping pong ball through a strobo flash. Generally you do maybe 12 flashes, not 50. Although it doesn't have the power output of these units, I recently picked up a rebranded Godox speedlight from Adorama, and that little sucker can flash up 199 hz for a given number of flashes, dependent on your power setting, as you can see from the chart below. Not bad for $100 speedlight. I think this may be cool for some experimental work, I offhand can't think of too much to do with it at this time, but it's an interesting option to have. Thanks Joshua, that's what I thought although I can't see when I'd ever use that. How do you meter for stroboscopic flashes? You meter for one burst. Ideally the subject shouldn't occupy the same space in the frame twice to not "cook" that space in the picture. I was thinking about that myself, as this reminded me of the same option I have in a speedlight I recently picked up, as I've mentioned elsewhere here. For the most part (for what I do) it would be experimental. One example I thought could be useful would be in shooting a model wearing an article of clothing, walking and turning within your live shooting area. Setting the flash to, say, 3-4hz and having him or her spin as they walk, you could showcase the product from front, sides, and rear in one frame. For an added effect/schtick you could shoot synchro with ambient and have some motion blur between flashes. This is an idea off the top of my head of course, and the art director and/or client would need to like/approve it (after all, you could easily drop multiple views into a page layout program), but you get the idea. You can use it for product or other stationary object photography. You can increase the possible exposure by firing multiple times so you can get deeper dof. I have never use this feature but it is one idea that comes to my mind. Yeah. For me, they're not. Since PCB gear is not available in Europe, the manufacturers there have no real competition. And, Bron is in Switzerland, whose currency is suddenly stronger now, making their products more expensive for the rest of the world. Nice hardware, but I don't see anything being mentioned regarding HSS or TTL on these which are offered by PROFOTO . True, but these are a more equivalent comparison to the Profoto D1. The B1 is the only option with the features you just suggested, and is a totally different animal. It does have HSS. I know the ones with the PW module can go up to 1/8000 with the bulb that's meant for it. It's cheap luckily. I think HSS and PocketWizard (PW) Hyper Sync are being confused here, no? I'm no pro by any means and I don't even play one on TV. But, the two are different. I'd be sold on an 800S if they demonstrated the Hypersync feature on a unit complete with special flash tube and PW module. I've also found that getting t.1 times out of Broncolor and vendors on the Siros is like pulling teeth. Lots of hemming and hawing, but no straight answer. These new developments in the mono block design, must surely make it difficult to justify the expense and bulk of the seperate power pack concept, especially with the higher iso performance of modern cameras.. I currently use Profoto D1's, but these look awesome..
Why oh why didn't they put a lever on the knob!? @Michael Woloszynowicz Did you take pics of the unit bending the focusing rod when you used it? I have a friend that says that you are mistaken in that area about the Siros unit bending the focusing rod. You really need to edit out where you state the Siros can bend the focusing rod on a Para. It's simply not true and there are many videos all over the web to prove it.